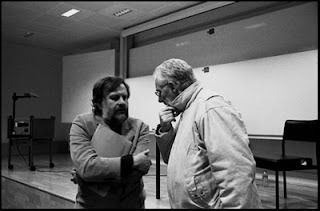 At the moment, I’m using every spare moment to read the philosophers Slavoj Žižek and Alain Badiou – and they’re blowing my mind. I really wish I had read Badiou sooner. His little book on Saint Paul is an astonishing tour de force – an atheist reading of Paul which is far more profound (and far more theological) than most recent theology! In particular, I’m wondering whether Badiou’s conceptions of “the event” and of “universal singularity” might provide a useful way of understanding Jesus’ resurrection. Is anyone else out there interested in Badiou at the moment? And does anyone know of any contemporary theological work which engages with his thought (apart from Milbank)? “With Paul, we notice a complete absence of the theme of mediation. Christ is not a mediation; he is not that through which we know God. Jesus Christ is the pure event, and as such is not a function, even were it to be a function of knowledge, or revelation…. Christ is a coming; he is what interrupts the previous regime of discourses. Christ is, in himself and for himself, what happens to us. And what is it that happens to us thus? We are relieved of the law. But the idea of mediation remains legal…. [This idea is] a muted negation of evental radicality” (pp. 48-49).